CALGARY, Alta. 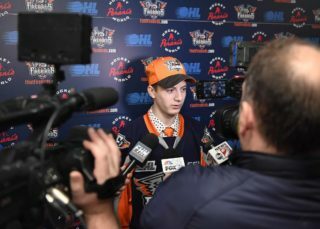 – Flint Firebirds’ goaltender Luke Cavallin and forward Ethan Keppen are among forty-four of Canada’s top under-18 hockey prospects that were invited to compete for a chance to represent Canada’s National Men’s Summer Under-18 Team at the Hlinka Gretzky Cup in Edmonton and Red Deer, Alberta this August. Last year at the Hlinka Gretzky Cup (formerly the Ivan Hlinka Memorial Cup), Firebirds’ Ty Dellandrea was one of 22 players that helped Canada claim gold on Aug. 12 (read more). Flint’s bench boss Ryan Oulahen will be one of three coach’s for Canada at the prestigious tournament this year (read more). Newly rebranded as the Hlinka Gretzky Cup, the annual tournament is one of the only true, best-on-best competitions for this age group. While the event is being co-hosted in Edmonton and Red Deer, Canada will play all of its games out of Rogers Place in Edmonton (home of the NHL’s Edmonton Oilers), except for a pre-tournament game against the Czech Republic slated for 7 p.m. on Aug. 4 at the brand-new Servus Arena in Red Deer. 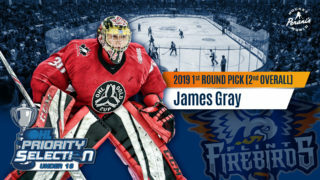 The invitations have been extended to four goaltenders, 14 defenseman, and 26 forwards who are developing in the CHL and CJHL, including three players who were part of Canada’s National Men’s Under-18 Team that competed at the 2018 IIHF U18 World Championship in Russia last April, going undefeated in preliminary-round action (Byram, Lafrenière, Robertson). Canada won last year’s edition of the event in Breclav, Czech Republic, besting the host team 4-1, with a squad that included 18 players who were selected in the 2018 NHL Entry Draft last weekend. 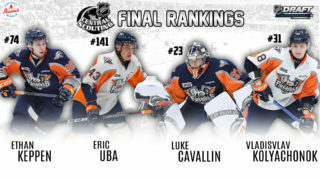 When all of the picks were in, 77 alumni of the event were selected by NHL Clubs – 19 first-rounders, in fact – including seven of the top-10 picks.